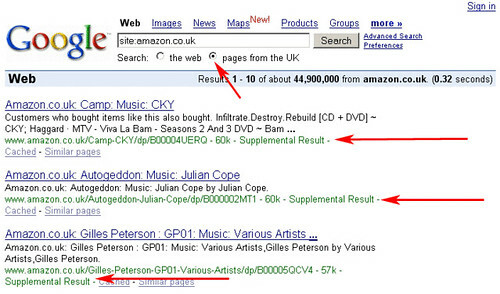 Google Placing UK Filtered Results in Supplemental Index? Home > Google News > Google SEO > Google Placing UK Filtered Results in Supplemental Index? Gabs, a moderator at Search Engine Roundtable Forums, discovered an interesting way of determining how to find supplemental results on .co.uk domains. Ok so you have a .co.uk and your using the site command to check the number of indexed page but by mistake you have the “pages from the uk” selected.. Bammm.. Only sup’s are returned.. The problem is that google.co.uk is pretty much filtering out the UK results into the supplemental index. But in this second result, where only pages in the UK are being searched, there are over 44 million results. Notice how all of them are tagged as a supplemental result. This is indeed a nice find, but I don't think google.co.uk was meant to work this way. It would be neat if we can have a tool that does this more easily though, so for now, this will suffice for UK folks.